Welcome to the Saguaro National Park Information Page. 1. Take I-17 South to I-10 East to Tucson and the park. 2. Take Highway 89 South to I-17 South to I-10 East to Tucson and the park. 1. Take I-40 West to I-17 South to I-10 East to Tucson and the park. 2. Take I-10 West to Tucson and the park. 1. Take I-19 North to Tucson and the park. 2. Take Stateroad 80 North to I-10 West to Tucson and the park. 1. Take I-40 East to I-17 South to I-10 East to Tucson and the park. 2. Take I-10 East to Tucson and the park. 3. Take I-8 East to I-10 East to Tucson and the park. Saguaro East, or the Rincon Mountain District, may be reached from Tucson by traveling east on Broadway or Speedway to Freeman Road; turn right to Old Spanish Trail; turn left. Look for signs to park entrance. Saguaro West, or the Tucson Mountain District, may be reached from Tucson by traveling Speedway Road west. Speedway becomes Gates Pass Road; the road ends at Kinney Road where you turn right and continue to the park entrance. Note: Saguaro East and West are each about 15 miles from downtown Tucson. Along Interstate 10, there are signs directing travelers to Saguaro National Park. Bus lines and major airlines serve Tucson which is a short drive from the park. Both districts of the park feature scenic loop drives. The Saguaro National Park was made a national monument in 1933. In Nov of 1961, President Kennedy signed a bill expanding the monument to include Tucson Mountain Park. Then on 14 Oct 1994, Saguaro National Park was established. Saguaro National Park is open year round, daily from sunrise to sunset, with peak visitation in March. The saguaro has been described as the monarch of the Sonoran Desert, as a prickly horror, as the supreme symbol of the American Southwest, and as a plant with personality. It is renowned for the variety of odd, all too human shapes it assumes, shapes that inspire wild and fanciful imaginings. Giant saguaro cacti, unique to the Sonoran Desert, sometimes reach a height of 50 feet in this cactus forest, which covers the valley floor, rising into the Rincon and West Tucson mountains. Since 1933 this extraordinary giant cactus has been protected within Saguaro National Park. Preserved along with it are many other members of the Sonoran Desert community, other cacti, desert trees and shrubs, and animals. 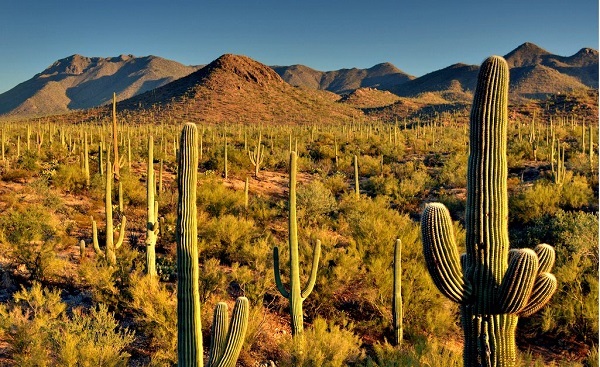 In lushness and variety of life the Sonoran Desert far surpasses all other North American deserts and yet paradoxically, it is one of the hottest and driest regions on the continent. Summer midday temperatures commonly climb above 100 degrees F. Less than 12 inches of rain fall in a typical year. Between summer and winter rainy seasons, it is not unusual for months to pass without a drop of rain. The plants and animals able to survive this environment, with adaptations specially designed for desert survival, make up one of the most interesting and unusual collections of life in the United States. Visitor centers, restrooms, picnic areas, and some trails and programs are fully accessible. Saguaro East encompasses an aging saguaro forest at the foot of the majestic Rincon Mountains, as well as an exceptional variety of other desert communities. Saguaro West embraces a variety of Sonora Desert life against the backdrop of the rugged Tucson Mountains. A popular way to view native plants and animals while surrounded by the spectacular scenery of the Sonora Desert is to take a bike ride around the Cactus Forest Loop Drive. There is no drive-in camping in the park. Backcountry camping is permitted in Saguaro East; a free permit is required and can be obtained at the visitor center. There are 6 backcountry campgrounds; Douglas Spring, Grass Shack, Happy Valley Saddle, Juniper Basin, Manning Camp and Spud Rock. The Tanque Verde Ridge and Douglas Spring Trails lead to the higher elevations of the Ricon Wilderness area. The west district has no entrance fee. Food and supplies are available in Tucson. A hike in Saguaro National Park can be a stroll on a day trail or a long wilderness trek. Within a mile of the visitor center in Saguaro West, there are two nature trails, the Cactus Garden Trail and the Desert Discovery Nature Trail. There are approximately 128 miles of trails that wind through the desert and mountain country of Saguaro East. Hiking and other strenuous activities in extreme heat can be hazardous. Pace yourself and rest often. There is no water available at the picnic areas or along most trails. Drinking water is essential. Each person should carry at least one gallon of water per day. Persons planning to hike or ride a horse on the longer park trails should carry a topographic map. Beware of painful encounters with cacti and other prickly plants. Horses are prohibited from traveling off trail throughout the park. Horseback riders must access the Douglas Spring Trail via the Wildhorse Trailhead. It is located on Speedway Boulevard, .12 mile west of Douglas Spring Trailhead. Horseback riding is permitted on all trails except the Tanque Verde Ridge Trail, Miller Creek Trail, and Rincon Peak Trail. There is no lodging in the park. Permits are needed for backcountry camping. Pets are allowed on paved roads only and must be leashed. There are seven picnic areas in the east and west Saguaro National Park. There are two visitor centers. Winters are delightful with mild warm days 60 F to 70 F, and cool nights 40 F. Summers can be extremely hot with daytime temperatures of 100 F to 115 F in the shade, and evening lows in the 80’s. Long hikes are not recommended in the summer. Even short hikes require lots of water, a hat and sun screen lotion.